Obviously, there’s no lighting source more brilliant in appeal than chandelier lighting. Due to their wonderful qualities and aesthetics, chandeliers have evolved as necessary fixtures not just in luxury hotels but now in homes as well. 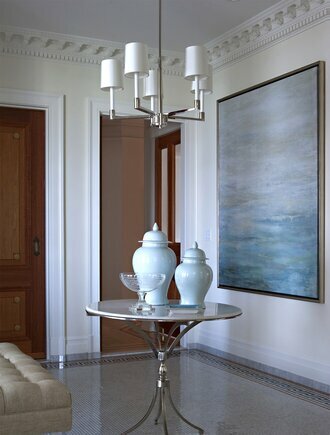 Lighting is an important element in any room. It can set a romantic mood or offer a bright, playful vibe. However, the rules of where to hang a chandelier vary by room and can be tricky to master. We break down the size and placement guidelines for chandeliers and take the guesswork out of hanging a chandelier. An entryway is a guest’s first impression of your home, and chandeliers often play a large role in that impression. You will want to choose a chandelier that reflects your home’s design aesthetic and is the right size for your space—a small light will look dwarfed, while a too-big chandelier can overpower a room. Here are two important measurements to take into consideration when choosing the correct chandelier size: height and diameter. The higher the ceiling, the taller the chandelier. The rule of thumb is to accommodate 2.5-3 inches of chandelier height for each foot of ceiling height.A standard 8-foot ceiling requires a chandelier that is 20-24 inches in height. Once you have the height, it’s time to figure out the diameter. 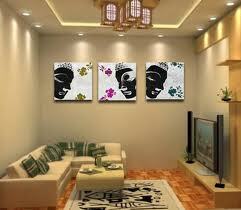 To do this, add the height and the width of the room together. Treat that sum as inches, and you have the suggested diameter of the chandelier for that space.For example, if the room is 20 by 18 feet, the sum is 38 feet. The approximate diameter of a chandelier in that area is 38 inches. This can vary depending on what room you are hanging your lighting in. The most important concern when hanging your chandelier is how it effects the lighting of the space. In a dining room, it is key to measure accurately to ensure perfect placement of the right-size light. 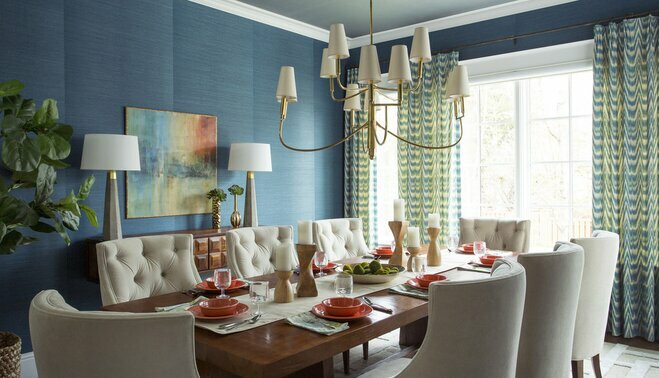 Chandeliers should be centered over the dining table. The exception to this is if you are placing two smaller chandeliers over the table instead of one.The light fixture should be hung 30-34 inches above the dining table. This same rule holds true for lighting over islands and kitchen tables.